Bert Weckhuysen has been invited to join the Royal Flemish Academy of Belgium for Science and the Arts (KVAB). On 12 December, Weckhuysen will formally be welcomed at the Public Meeting as a ‘foreign member’ in the Class of Natural Sciences. “It is a great honor, but it is also a bit unreal as a Belgian to be admitted to a Belgian institute as a ‘foreign’ member”, Weckhuysen says. The KVAB is a royal scientific society for the encouragement of science and the arts and to promote them to society at large. The Academy consists of four Classes: natural science, social science, arts and technical science, each with around 60 members who are appointed for life after a process of nomination and peer review. In addition to the ordinary members, each class has a few dozen foreign members, who act as the KVAB’s ‘antennae’ to the international scientific community. Weckhuysen is one of the few Dutch researchers who have been invited to become a member. The other Utrecht researchers in the Class of the Natural Sciences are Kees de Jager, Professor Emeritus of Astronomy, and Nobel Prize winner Gerard ‘t Hooft, Professor of Theoretical Physics. 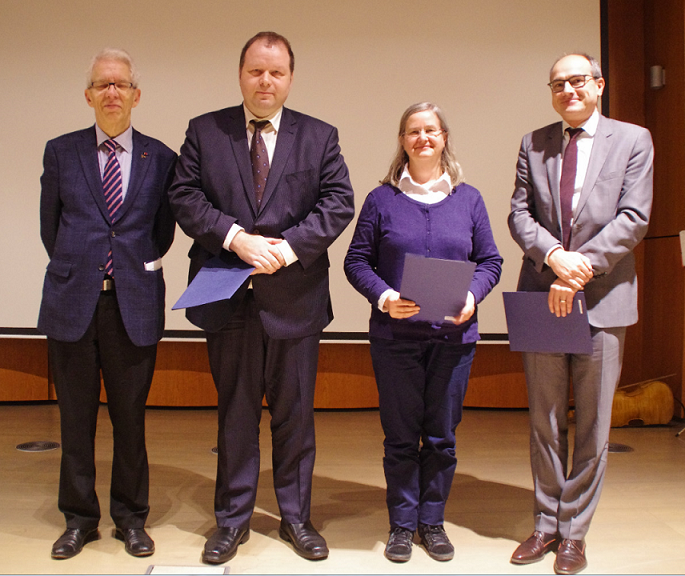 Photo: Prof. Paul Van Houtte and the 3 new members.